Puget Sound PMC honorees receive congratulations. From left, MM&P Pres Capt Don Marcus; Mrs and Capt Mike Murray with the Lifetime Achievement Award; USCG Capt (ret) John Dwyer with the Maritime Person of the Year Award; and Capt Tim Saffle, PMC Exec Board Trustee. 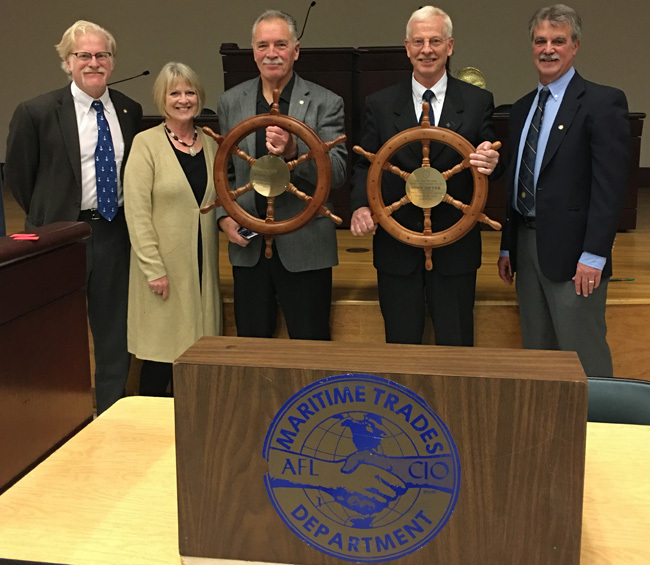 The Puget Sound Ports Council recognized two individuals from the area’s maritime community at its annual awards luncheon that raise almost $2500 for Mission to Seafarers Center. Captain James Murray received the PMC’s Lifetime Achievement Award, while Captain John Dwyer got the Maritime Person of the Year Award on October 17. The event was held at Machinists District Lodge 751 in Seattle. Murray is the past vice president of United Inland Group for the Masters, Mates & Pilots. Dwyer is a retired U.S. Coast Guard officer in charge of the Marine Inspections Sector for Puget Sound. For years, the Port Council luncheon has benefited the Seattle-based center, which works with crews from commercial and fishing vessels by providing phones, computers and Wi-Fi connections. PMC Secretary-Treasurer Vince O’Halloran reported the luncheon was well attended and a big success.